Have you ever walked past a place so many times you’ve never notice it? Like many places in the world, Tokyo can be like that. You’ll walk through an area many, many times and you just don’t see something to hiding in plain sight, or it is hidden in the clutter or maybe it is just in a corner out of your usual line of sight. The Yasuyo Building in Shinjuku is one of those places. For architecture lovers, it needs to be on their bucket list. Over the years I’ve walked past it so many times, but I never took notice of it. I mean, when you first come to a city like Tokyo, there are so many things to see, the place can be quite overwhelming. So much to see, and you just can’t quite process it all at once as you come across each thing instantly. In the end you miss out on so much. It can be quite annoying! 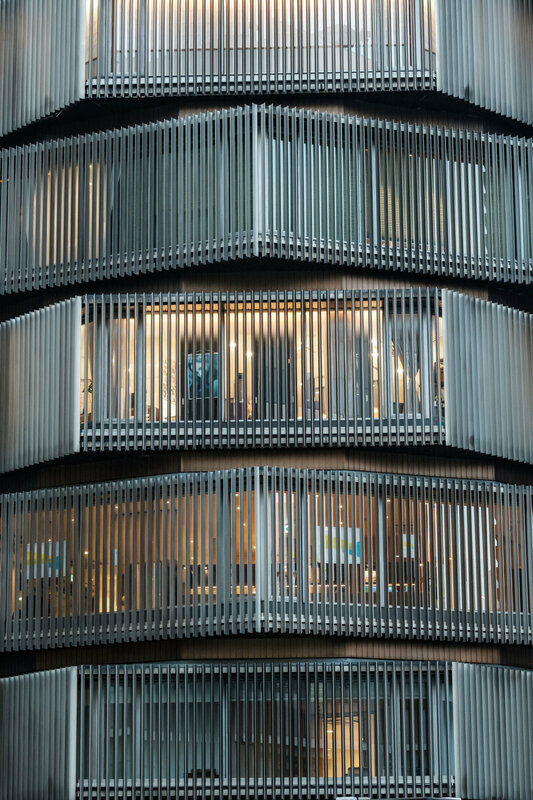 The Yasuyo Building is one such building. It just doesn’t get noticed, generally speaking. Built in 1969, it is quite narrow and kind of looks like a stack of Lego blocks that a child has roughly placed one above the other. It is just around the corner from the eastern exit of Shinjuku Station, in a corner, out of the way where many people just don’t see it. Unfortunately this famous building doesn’t get more attention. Inside you’ll find, Kakiden, a restaurant that is on the 6th, 7th, 8th and 9th floors. The restaurant has interiors designed by Yoshiro Taniguchi. Other floors have a soba restaurant, a beauty salon and a bank. Yasuyo was designed by Nobumichi Akashi and apparently he said he wanted it to be representative of the fast pace of life in Tokyo. It is something a bit different. There is no other building the area that I know that looks like the Yasuyo Building. It might have been built fifty years ago, but it is still a very cool looking building. If you want to see the website for Yasuyo Hall which is inside the building, you can see that here.